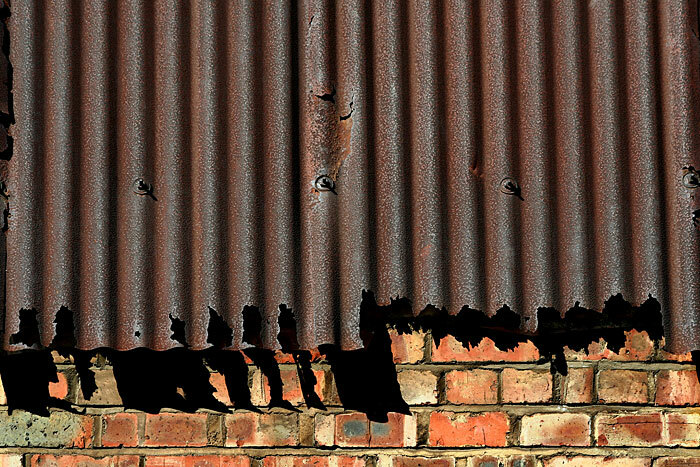 These photographs are more influenced by my interest in the qualities of shape, pattern, texture and colour rather than in recording corrugated iron as a structural material. 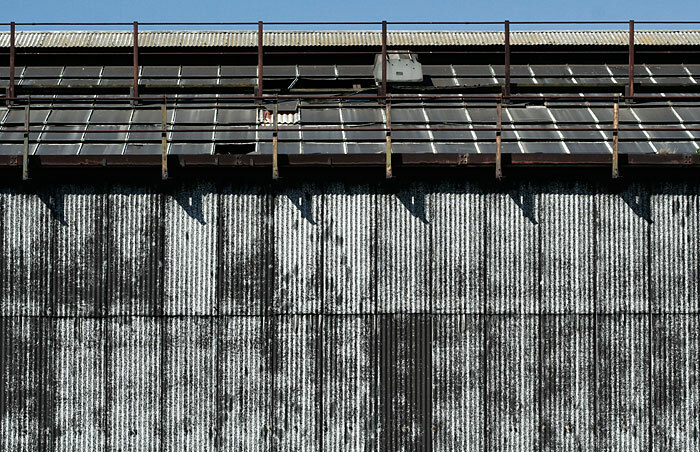 All but two of them are details from industrial buildings clad with the material; those two show a completely different agricultural use. 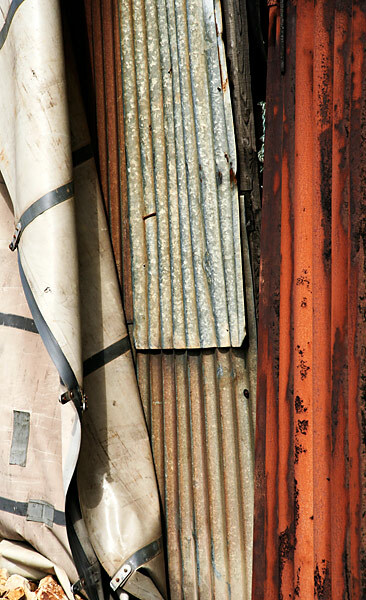 Brief notes on the history and use of corrugated iron, captioned 'History', are placed under some images. Images 01-06 show a decaying building at Weatherhill sand quarry. It was once served by the Stanhope & Tyne Railway built in the early 1830s between nearby Stanhope and South Shields on the River Tyne. Its principal purpose was the carriage of minerals and its trains were rope hauled on inclines or drawn by horses and steam engines on easier grades through the North Pennine hills. The Stanhope & Tyne Railway closed in 1951. Weatherhill stands at the top of the uppermost of two inclines north of Stanhope. The substantial stone building housing the steam powered winding engine stood close by and was demolished in 1962. The huge winding engine is still in working order at the National Railway Museum in York. The quarry building stands on high ground completely exposed to the prevailing westerly winds, snow and rain. 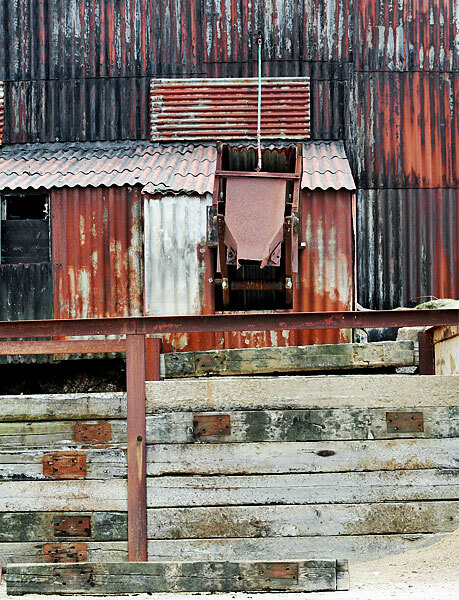 Its still houses a rusting rotary stone crusher and occasionally shelters a vehicle or two. 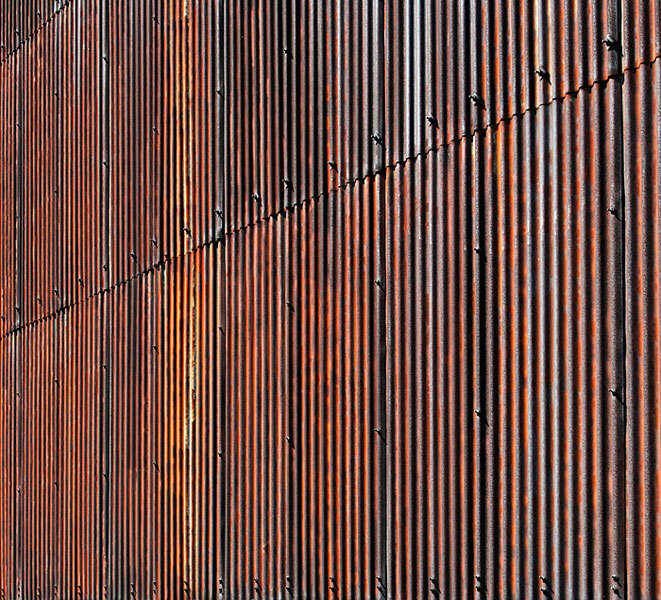 The rust colours are quite startling in their intensity, contrasting with the eroding black tar coatings and the various materials fixed over wind-blown gaps in the cladding. Henry Robinson Palmer (1795-1844) was Architect and Engineer to the London Dock Company. In 1818 he, with others, established the Institute of Civil Engineers: Thomas Telford became President in 1820. 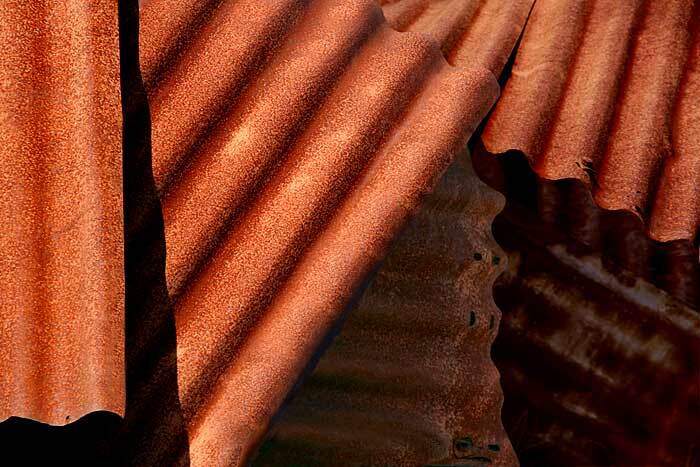 In 1829 he registered a patent for a machine with fluted rollers that corrugated metal sheets to stiffen for use as roofing or cladding for buildings. 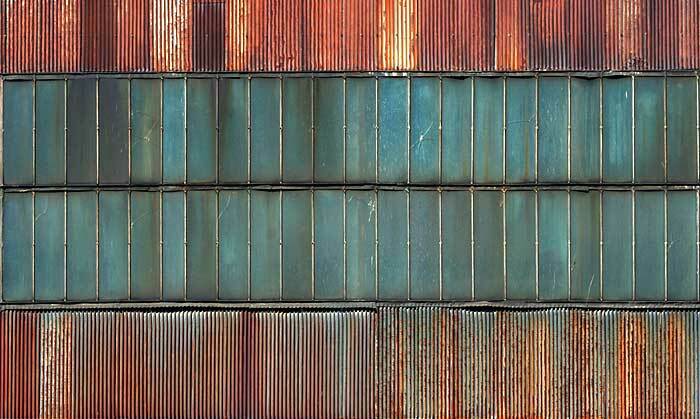 Thin wrought iron sheets were used initially but by the early 1890s had been supplanted by mild steel. Dipping into vats of molten zinc applied a protective coating that forms a crystalline pattern. The protection it provides can last a long time but clearly this depends upon the environment of the structure it sheaths. 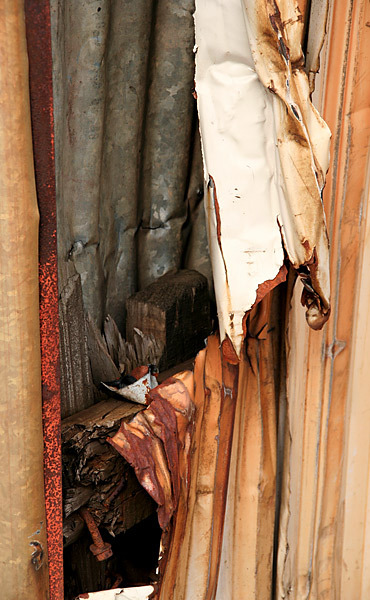 Edges and fixing holes are entries for moisture and decay. Rookhope in Weardale was a nineteenth century lead mining centre linked to the nearby Stanhope & Tyne Railway by the Boltslaw Incline which had a steam powered winding engine at its summit. Now a footpath, the incline still has railway remnants. It also had these improvised sheep shelters assembled on the ground from curved sheets of large radius corrugated iron (07 & 08). 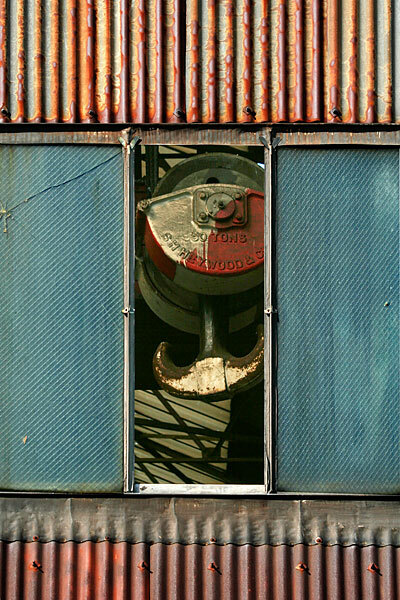 The Industrial Revolution increasingly required large volume buildings to enclose machinery and manufacturing. 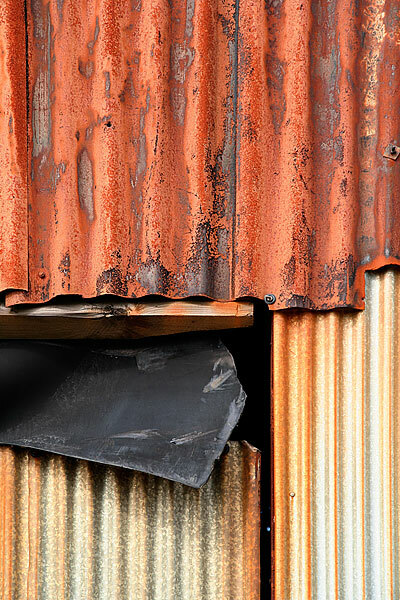 Corrugated iron attached to an iron framework answered that need quickly and cheaply. Docks, shipbuilding and ironworks were typical applications. Brunel's original designs for Paddington Station specified corrugated iron as a major roof covering. 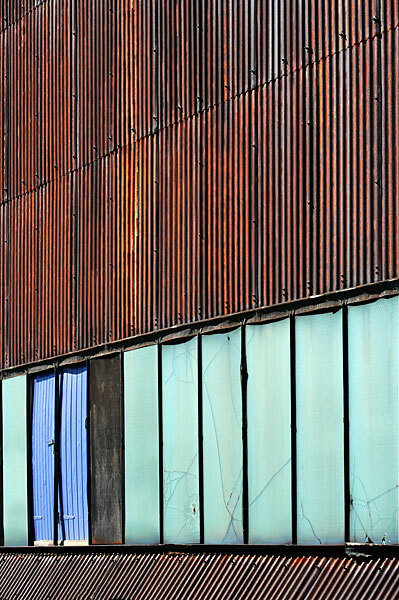 This shed stands on the site of a former drift mine near Stanhope; some derelict buildings and foundations of others remain. I liked the pictorial combination of sheet shapes, white, grey and rust-red colours, and the staccato punctuation marks of the fixing bolts. Whilst this industrial building was under demolition it was ravaged by fire. Entry to the site was specifically forbidden and I had to be discontent with a distant view through a long lens. I would have liked to look more closely at the colours and distortions the flames had inflicted on this rectangular profile cladding. Middlesbrough was great centre for heavy industry in the nineteenth and twentieth centuries. The decline and disappearance of many of these has seen much demolition and reconstruction. 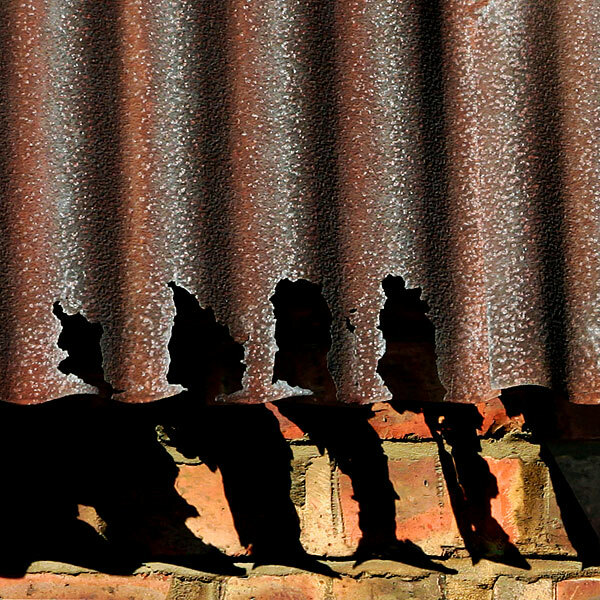 Images 12-18 are details from some of the accessible corrugated iron clad structures that survive in the town's industrial areas. 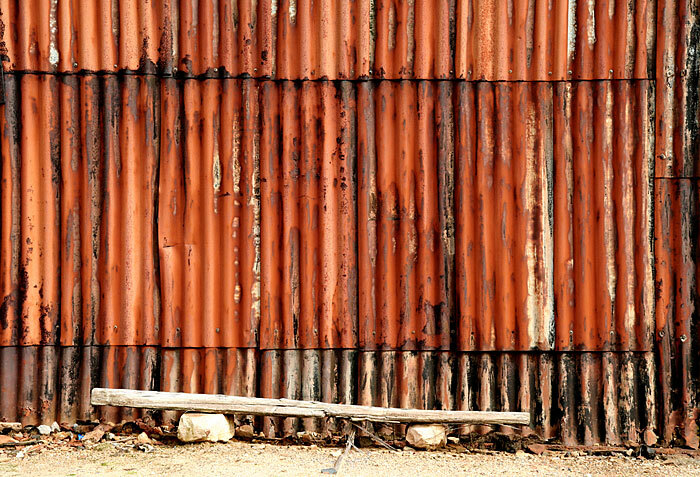 In 1829/30 Henry Palmer and the London Dock Company completed the world's first building roofed with corrugated iron. 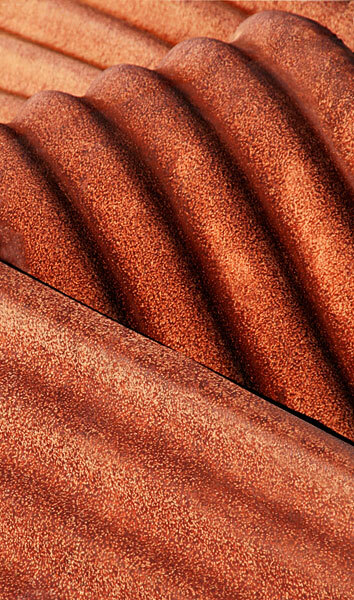 Curved sheets riveted together formed a self-supporting roof resting on cast iron columns linked longitudinally by cast iron gutter beams and laterally by tie-rods. 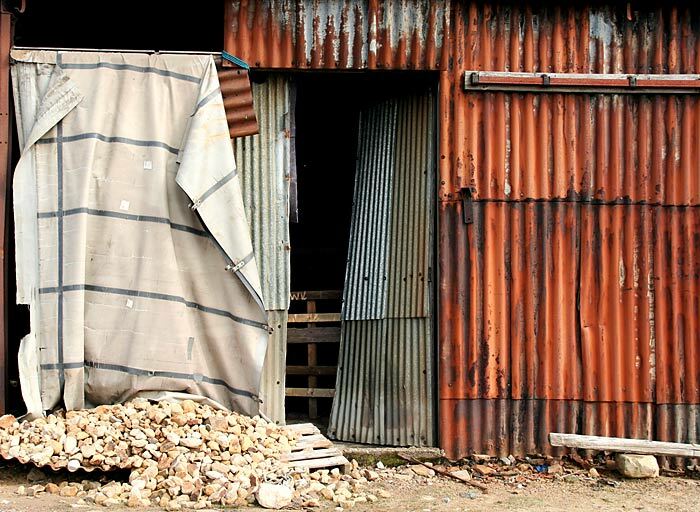 It was the precursor to the First World War aircraft hangers and Major Nissen's huts. The simplicity of the material, its ease of manufacture, portability and its ready incorporation into prefabricated structures gave great versatility and practicality. Brunel used it in a prototype hospital for use in the Crimean War. Nineteenth century catalogues offered prefabricated building kits, including churches, for delivery and erection anywhere. 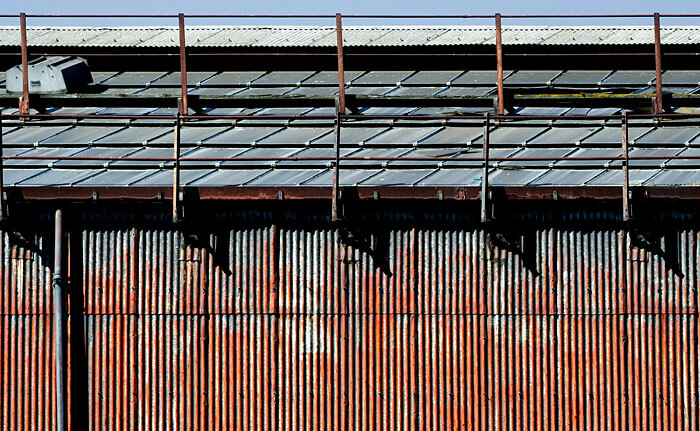 Corrugated iron on steel frames form the structure of the airship sheds at Cardington in Bedfordshire, enclosing a volume L812 feet X W180 feet X H 157 feet. St Mary's Church in Newton-by-the Sea in my native Northumberland is just as unique in concept but on a much more modest scale. Similar 'Tin Tabernacles' survive elsewhere in the British Isles. After the war, the Orcadians undertook the preservation of the chapel. Returning in 1960 and 1964 Domecico Chioccetti worked to restore the interior and to add further embellishments. Although it is a long journey by land and sea the Italian Chapel attracts visitors to its unique enhancement of a prosaic military structure. The Moody-Gosset House (1859) in Victoria, British Columbia, is a surviving example of houses manufactured and exported by the Hemmings Iron Company in England at that time. Its all-round veranda seems more appropriate to warmer climates. A cottage in Amberley, Gloucestershire, is embellished with carved barge boards on projecting bays and decorative cast iron ridge tiles. Glenn Murcutt is an Australian architect who works alone on designs for environmentally sympathetic buildings. Most are residential, such as the Magney House (1984) and the Marika-Alderton House (1994), with the Boyd Education Centre as one of his public buildings; all incorporate corrugated iron into their structures.